For some years I have been asking for an open, honest and independent inquiry into the operations of the Australian Bureau of Meteorology. In 2015, I wrote to the Auditor-General of Australia suggesting a performance audit with terms of reference to include: consistency with its own policies, and reliability of methodology. At the time my primary concern was the remodelling of raw data through a process known as homogenisation. In response, it was suggested I direct my concerns to Dr Ron Sandland AM, who at that time was chairing a Technical Advisory Forum to review these same issues, that I had previously raised with then Minister for the Environment, Hon. Greg Hunt MP. It was already clear to me that Dr Sandland and his team were undertaking a most cursory review and not working through a single example of homogenisation. I nevertheless made a submission to Dr Sandland’s Forum that has never been acknowledged. To be clear, my issues continue to be less with the actual policies, protocols and best practice manuals already in place, but with increasing evidence these are being systematically ignored. The one issue that I would like to bring to your immediate attention concerns the way temperatures are currently measured in automatic weather stations by electronic probes. This goes to the heart of the integrity and reliability of temperature measurements recorded by the Bureau, which are subsequently homogenised, and incorporated into international databases – including those relied upon by the United Nation’s Intergovernmental Panel on Climate Change (IPCC). Historically maximum air temperature was measured by mercury thermometers – worldwide. But over recent decades there has been a transition to electronic probes in automatic weather stations. There is a lot of natural variability in air temperature (particularly on hot sunny days at inland locations), which was smoothed to some extent by the inertia of mercury thermometers. In order to ensure some equivalence between measurements from mercury thermometers and electronic probes it is standard practice for the one-second readings from electronic probes to be averaged over a one-minute period – or in the case of the US National Weather Service the averaging of the one-second readings is over 5 minutes. The Australian Bureau began the change-over to electronic probes as the primary instrument for the measurement of air temperatures in November 1996. The original IT system for averaging the one-second readings from the electronic probes was put in place by Almos Pty Ltd, who had done similar work for the Indian, Kuwaiti, Swiss and other meteorological offices. The software in the Almos setup (running on the computer within the on-site shelter) computed the one-minute average (together with other statistics). This data was then sent to what was known as a MetConsole (the computer server software), which then displayed the data, and further processed the data into ‘Synop’, ‘Metar’, ‘Climat’ formats. This system was compliant with World Meteorological Organisation (WMO) and the International Civil Aviation Organisation (ICAO) standards. The maximum daily temperature for each location was recorded as the highest one-minute average for that day. This was the situation until at least 2011 – I have this on good advice from a previous Bureau employee. It is likely to have been the situation through until perhaps February 2013 when Sue Barrell from the Bureau wrote to a colleague of mine, Peter Cornish, explaining that the one-second readings from the automatic weather station at Sydney Botanical Gardens were numerically-averaged. At some point over the last five years, however, this system has been disbanded. All, or most, of the automatic weather stations now stream data from the electronic probes directly to the Bureau’s own software. This could be an acceptable situation, except that the Bureau no-longer averages the one-second readings over a one-minute period. Indeed, it could be concluded that the current system is likely to generate new record hot days for the same weather – because of the increased sensitivity of the measuring equipment and the absence of any averaging/smoothing. To be clear, the highest one-second spot reading is now recorded as the maximum temperature for that day at the 563 automatic weather stations across Australia that are measuring surface air temperatures. This is not generally understood. Most meteorologists and university professors in Australia appear to be working from the wrong assumption that the old system is still in place. Given this data is also used by thousands of other scientists and technologists, not just in Australia but across the world, I urge you to investigate. 3. The lowest one-second reading for the previous 60 seconds. I have corresponded with the Bureau’s CEO, Andrew Johnson, about the current situation. He has assured me that because the electronic probe is housed in a metal sheath which provides thermal mass, each measurement is actually the integration of the previous 40 to 80 seconds. If this is indeed the case, that the electronic probes have been weighted, then the Bureau should perhaps just sample the lowest one-¬second and the highest one¬-second for the agreed interval? Indeed, why log a single last one-second value from each minute – particularly given the equipment is capable of averaging all seconds, or averaging a subsample of all the one-second readings? There is no publicly available documentation for any of the custom-built electronic probes currently used by the Bureau to measure air temperature across Australia. Furthermore, there are no published studies that provide any indication of the equivalence of measurements from the electronic probes with mercury thermometers, which were used to measure maximum temperatures at all weather stations until at least November 1996. In order to assess the extent to which the Bureau’s probes actually mirror the behavior of mercury thermometers, I have requested the relevant internal reports that presumably detail the results from field and laboratory trials. These have not been provided. My husband, Dr John Abbot, has requested the same and this information is the subject of an ongoing freedom-of-information (FOI) request by him, which may yet end-up in the Administrative Appeal Tribunal. Following two interviews I did with radio broadcaster Alan Jones last year, and at the directive of Minister Frydenberg, I was provided with some information enabling me to obtain parallel data from Mildura late last year. This was provided as thousands of photographed A8 forms with each form including hand-written daily values as recorded from the electronic probe and mercury thermometer in the same equipment shelter at Mildura. The first years of parallel recordings onto the A8 forms (from November 1996) indicate that the electronic probe first installed at Mildura was recording temperatures that were statistically significantly cooler than the mercury thermometer. This should be of concern, as it would indicate that the extent of global warming was being under estimated – and that there was no equivalence between the electronic probes and mercury thermometers with this data incorporated into international databases. A new probe, the current probe, was installed on 27 June 2012. This is the same probe that measured a much-acclaimed record hot day for the state of Victoria on 23 September 2017- sparking my initial interest in Mildura. I had initially hoped that there would be parallel data to enable some verification of this record – I had been told by a whistle-blower that Mildura was a site with parallel data. I was subsequently told by Anthony Rea from the Bureau – after the directive given to the Bureau by Minister Frydenberg – that there was parallel data only available through until January 2015. After scrutiny of the A8 forms actually provided, however, it appeared that the extent of parallel readings for the probe installed on 27 June 2012 would be limited to just the eight months July 2012 to February 2013… except that Dr Rea omitted to provide me with the data for September 2012 – the one month that could provide a direct measure of the equivalence of the relevant probe for that time of year at that location. The residual available parallel data from Mildura as measured by the current electronic probe is missing recordings from the mercury thermometer for the very hottest days as measured by the electronic probe (30 November 2012, 18 January 2013, 5 January 2013, 8 January 2013, 6 January 2013, 1 December 2013, highest to lowest). In short, it appears that on the hottest days in Mildura – during the period that manual readings were being taken after installation of the most recent probe – no one was turning-up to take the manual reading from the mercury thermometer. As a consequence, the data for this period from the mercury thermometer is not normally distributed. This makes statistical analysis using standard techniques impossible as assumptions implicit, for example in a standard paired T-test, are violated. The limited parallel data that I have from this probe (currently recording temperatures at Mildura) indicates that, on average, it records temperatures warmer than the mercury thermometer – often up to 0.4 degrees Celsius warmer than the mercury thermometer. I have communicated this information to Dr Johnson, and he has replied that my sample is inadequate to conclude very much. Exactly, and this is because the Bureau is not providing me with all the data! So, I would appreciate it if you could ask that he please make the relevant internal reports available and/or provide data from other weather stations for which there is parallel data to enable some proper comparisons and assessment of the Australian-wide system. I have been reliably informed that there is parallel data (measurements from a mercury thermometer and electronic probe recording in the same shelter) for a further 37 sites, additional to Mildura. I have further been told that this data provides parallel reading to the present for some of these sites. But the Bureau is withholding this information. In summary, given the intense political interest in climate change with far reaching economic implications, and the relatively recent transition to a very different methods of measuring temperatures (mercury thermometer to electronic probe), it would be assumed that there are dozens of reports published by the Bureau that document how comparable the measurements have proven at different locations, and under different conditions. Yet there are none! Without independent verification, these temperature recordings of the Bureau are open to dispute and the integrity of the Bureau and the Government is degraded. I have heard you lament that there is an overwhelming consensus of scientific support for global warming and so we should just get on with solutions. But, without an independent verification of the Bureau’s temperature measurements then those who doubt global warming can easily dismiss the Bureau’s reports as unreliable and incorrect. To help resolve this issue I request that you provide me with the opportunity to present my findings – my evidence – to a relevant committee for proper scrutiny. WHILE the average Australian, being sentimental and having a nationalistic streak, would like to believe their Bureau of Meteorology is honestly recording and reporting temperatures, in reality the science managers are corrupting the official record. Following is another example, another story, to add to the litany as detailed in my unanswered letter to Minister Hunt and recent series of blog posts on Bourke. KEN Stewart, a retired school principal, became interested in global warming some years ago. After the Bureau released their new so-called High Quality temperature dataset, he decided he would audit it – out of curiosity. 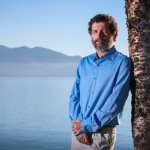 He found that changes made to the original data could account for as much as one third of the reported global warming in Australia. His queries to David Jones, Head of Climate Monitoring and Prediction at the Bureau, were dismissed with comment that the “adjustments” have “a near zero impact on the all Australian temperature”. Which would beg the question, why make the “adjustments” at all. Except that they do change the temperature, they create a significant warming trend. Eventually, on 20th December 2010, Ken joined Jo Nova, Senator Cory Bernardi and several others to lodge a request to the Auditor-General for a formal audit of the Bureau’s climate data and advice. But rather than defend the new dataset, the Bureau ditched it, in effect preventing the audit from going ahead. Then in March 2012, the Bureau announced a new official temperature series this time called the Australian Climate Observations Reference Network- Surface Air Temperatures (ACORN-SAT). This is the data series used by David Jones from the Bureau to announce in January that last year, 2013, was the hottest year on record ever in Australia. This “record hot year” is in large part a consequence of the methodology used to construct ACORN-SAT. Ken’s most recent analysis shows that in the creation of ACORN-SAT the Bureau has “adjusted” temperatures both up and down, with almost all the “adjustments” down occurring before 1971, and all the “adjustments” up occurring after 1971. In other words the record before 1971 is cooled, and after 1971 warmed. 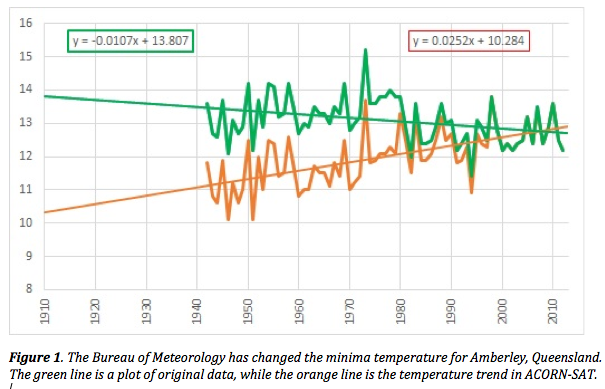 The mean difference in the minima trend (ACORN-SAT minus original data), according to Ken, is +0.37 degrees Celsius. Interestingly the difference in the maxima trend is much less, +0.09 degrees. This has the effect of exaggerating warming of the minima, creating a pattern consistent with anthropogenic global warming theory expectations. 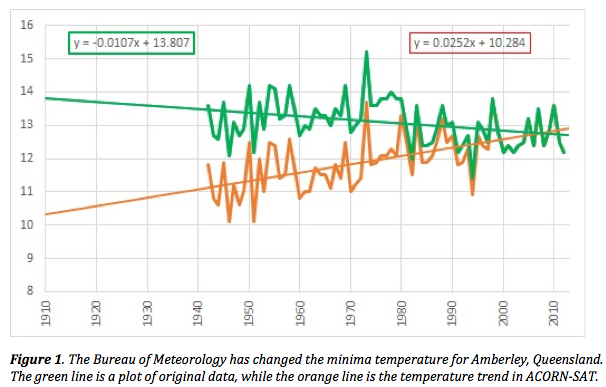 The most extreme example that Ken found of data corruption was at Amberley, near Brisbane, Queensland, where a cooling minima trend was effectively reversed, Figure 1. Ken Stewart is a retired school principal with a deep-seated scepticism for anything produced by governments, political parties, religious organisations, big business and Greenpeace. Ken believes in family, the power of learning, the importance of asking good questions and finding answers for yourself. We have ONE temperature record of Australia’s history gathered by thousands of individuals from countless measuring stations throughout the country and it should be fully digitized and made available on the BoM website. The BoM has not provided that. If anyone wishes to propose an adjusted version of that record they must put forward their reasons and methodology and present it as a published peer reviewed scientific paper for others to scrutinize and test. The BoM should meet it’s charter and be a recording bureau of temperature, and other climate data, for the citizens of Australia, nothing more, nothing less. Ken has done a magnificent job of proving what we have suspected for some time. To add to Ken’s post, the BoM seems to have been very careful not to let the the max temp get to far out of ‘sinc’ (-0.09C Ken has worked out) by reducing the higher max temps and increasing the lower temps. An example is Sydney Obs for May 1957. Here is an extract from 1st May to 20th May. Note all the temps +25C have been reduced by 0.5C yet others have been only slightly reduced or slightly increased. This is for a station which would have had exemplary record-keeping so the variation between raw and ACORN should not need such swings in adjustments. The monthly mean for May 1957 was 21.1C (raw) and 21.02 (ACORN) – within the 0.09C that Ken has found. However the number of +25C has been reduced by 1 which the BoM can point to in later press releases when comparing hot days (as Weatherzone has referred to recently). This is same adjustment regime that the BoM has done with the Bourke temperatures, esp Jan 1939. I’m sorry I couldn’t show their graphs but above is the full report with the graphs showing the lack of US warming up to 1999. So what happened in the 13 years since 1999 to show much more warming? Plenty of earlier SOUTH adjustments it seems, to make the present seem warmer. What’s happening to our climate? Was the heat wave and drought in the Eastern United States in 1999 a sign of global warming? How can the absence of clear climate change in the United States be reconciled with continued reports of record global temperature? Part of the “answer” is that U.S. climate has been following a different course than global climate, at least so far. Figure 1 compares the temperature history in the U.S. and the world for the past 120 years. The U.S. has warmed during the past century, but the warming hardly exceeds year-to-year variability. Indeed, in the U.S. the warmest decade was the 1930s and the warmest year was 1934. Global temperature, in contrast, had passed 1930s values by 1980 and the world has warmed at a remarkable rate over the last 25 years. Fig. 1: Annual and 5-year mean surface temperature for (a) the contiguous 48 United States and (b) the globe, relative to 1951-80, based on measurements at meteorological stations. A picture of how U.S. climate change during the past half century compared with the rest of the world is shown in Figure 2. This map shows that the trend has been toward warmer temperatures in most of the world. There has been nearly ubiquitous warming in the tropics, especially in the Eastern Pacific Ocean, where the largest warming coincides with the location of more frequent strong El Niños. The strongest warming has been in Alaska and northern Asia. Warming in Alaska is often associated with El Niños. A suspicion of many climatologists — as yet unproven — is that an increasing greenhouse effect may cause more frequent and intense El Niños. Asia has long been predicted to show the largest warming due to increasing greenhouse gases, especially in the winter, and observations are consistent with that. Christopher Monckton responds to the looney nonsense peddled by the fools who respect modelling before observations. Congratulations to Ken and also to Jen. If the adjustments were not catering 100% to the warming effort, if only occasionally they went the other way, sceptics would be a little more tolerant but when you add this consistent fiddling that is happening not just here but everywhere, to their rude, intolerant attitude to anyone who strays from the path of true belief, what other rational conclusion can any normal person draw? This is not about science. It is about ideology, money and control. Marc Morano kicks this CCTV anchors backside using scientific facts instead of ridiculous pseudo scientific mumbo jumbo. The dill even tries to quote Obama’s delusional report and misleads the viewers about so called extreme weather events and SLR etc. What a joker. Here is the abstract for the 2014 study on the positive change to the SAM. They state that this change started about 500 ( since the 15th century) years ago and point to warming on the Antarctic peninsula. But they also note that the rest of Antarctica has been COOLING for a thousand years. You can see the change on the graph showing James Ross island temp record and Antarctica below the abstract at bottom left. Of course this backs up the PAGES 2K study showing similar Antarctic cooling over the last 1000 years. The faithful need evidence to support their faith. And if it is fabricated. well so what? trends. This was a joint effort project started by John Daly and FAEC. Ken has a lot going for Ken. “Ken believes in family, the power of learning, the importance of asking good questions and finding answers for yourself. “ from Jens preamble. So among the things we can be sure Ken did to himself was find an answer himself. The proof is in the pudding. Step 1 in selfie answers – check the station catalogue. And what does it tell you. Why are you still re-arranging the deck chairs on the Titanic? Quibbling about a .05 difference is not going to change the FACT that the mean temp is increasing and quite rapidly at that. Give up on the denial and start to do something about it instead. Will you still be arguing this when the sea starts lapping over the wharfs in Sydney and houses are being washed away along the coast? Please explain to us Robert LP where this incredible increase in SLR is to come from? Mars perhaps? And please link to the recent dangerous SLR studies as I and others have in relation to a deceleration of SLR. But also please tell us how to fix or mitigate your silly delusions? And how long before we see a result, 5,000 years, 10,000 years? Just ask the RS and NAS. BTW it seems that govts continue to fraudulently promote and lie about the IPCC 5th report. Just like the above stupidity. Even the IPCC admits it’s just more falsification and BS. In one sense (only), I’m with Robert LP. I don’t care if there’s been only slight warming in the last century or a recent pause. Of course, it’s impossible to get steamed up over sea level rise, a natural process which began around ten thousand years ago, sped up a bit around the late 1700s, and has been very sluggish of late. But I won’t spoil Robert LP’s Titanic fun. No. What matters to me is that so much effort has gone into the manipulation and misinterpretation of data. Long after the climate panic is over, there’ll be fibbers for fun and profit. This is why Ken’s work matters. This is the original mean temp data for Amberley Aero from GISS NASA records (v1). 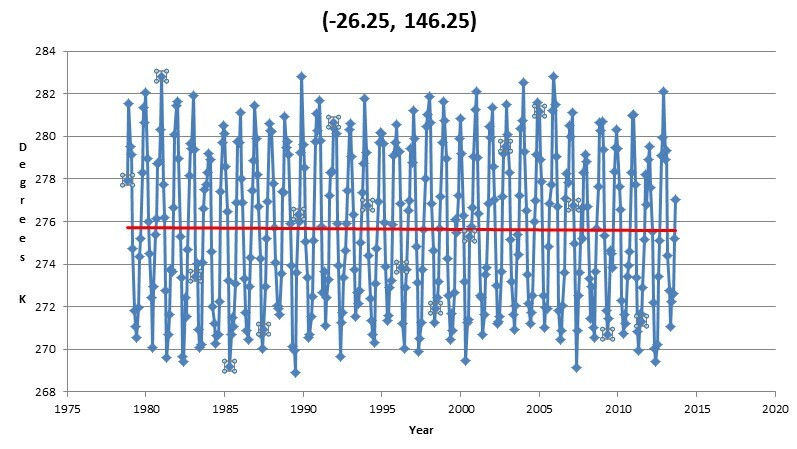 This is the adjusted record from GISS NASA (v4) – the agency which compiles all world temps for a global mean. See where the warming has come from? Just as I thought RLP can’t answer, just like Luke, bazza, JC etc. Even the RS and NAS study concedes that we can’t fix their delusional nonsense for thousands of years. And RLP can’t even provide a link to back up his stupid SLR claims. Here’s another new study (2014) from Jevrejeva et al showing 7 inches of SLR and no acceleration. What a travesty for RL Page and his fellow BS merchants trying to promote dangerous SLR and CAGW. Faith conquers science and proper observation I suppose? What a joke. Oh what a miserable life you must have RLP, do yourself a favour and have a look from the sceptics side and your life will improve quite dramatically. Only ignorance can underpin your current belief in the CAGW religion. you can thank sceptics later for bringing joy back into your life……. Thanks Ian George for the NASA link. Bazza, so you are confirming that there has been no site change at Amberley… same location… same aerodrome… but a need by the BOM to corrupt the data because it didn’t show a warming trend? Bazza, if it’s minima then the substantial change would be due to less cloud at night, which is how I remember the period post 1979. You couldn’t buy a good cloud bank around 1982-3, and again around 1993-4. Temps, like all stats, only tell a bit of a story. You still have to use your loaf. There are two weather stations mentioned for Amberley – Amberley AMO (040004) and Amberley Aero Comparison (040910). According to BoM’s Climate Data Online, 040004 has operated from Aug, 1941 and is still active. 040910 only operated from Jul 97 to Oct 1998. However, what is strange is that there is no indication when the 1941 manual station was closed and when the automatic w/s began. Even Weatherzone’s starts their records from 1942. Usually when an AWS is opened, it is usually designated its own w/s number distinct from the older manual station. As you point out, Amberley would have had an AWS by the mid-90s but can’t find the individual record for it (and Amberley is an ACORN station). Do you have any references to its history? So please confirm @ClimateOfGavin temps for Amberley changed because trend was not as expected? @ClimateOfGavin Understand inhomogeneities. But can we please get SPECIFIC reason why Amberley min temp. trend changed? Well, SPECIFICALLY because: we know it’s warming and that’s the only way we homogenise. Jennifer I think we know why temps are changed and that’s to further their CAGW nonsense. They’ve changed a number of the earlier records DOWN to show more warming today. Hansen and GISS are masters at cooling the past and our BOM just refuse to aknowledge the warmer 1890s to early 1900s as we’ve seen on earlier posts. bazza is a nuisance bazza is a nuisance..
That profound ‘event’ beginning in 1970 has not been removed from the homogenised data has it bazza? Instead the data after the ‘event’ has all been moved up. I f the ‘event’ is not touched or removed why is the subsequent data adjusted upwards? And why is the data before the ‘event’ adjusted downwards? And Schmidt advocating BEST! Well has he explained why BEST supports this marked change, not adjustment at Amberley? Robert LP, please allow me the chance to watch the houses floating away from Sydney. As NASA’s latest scare has sea levels rising by 4 metres in the next thousand years , please grant my the ability to live long enough. Assuming, of course , that the people who own the houses can’t figure out in time how to move them, or build a levee bank. NASA also warn us that the recent increase in Antarctic ice is temporary. No wonder people think they faked a moon landing. Even more O/T . A perfectly good science program on RN yesterday about community science, degenerated into a Karoly fest. It appears that all the computer capability at his disposal is too slow and he wants ‘THOWSANDS ‘ of citizen’s computers to help with his models. Get involved with AGW Church work and join the religion ? It is headed list of stations “near Amberley Aero” (Amberley is on the outskirts of Brisbane) and includes Bourke, Hamilton Island, Marion Reef and Longreach! You gotta laugh. … but I am crying on the inside. More data tampering at GISS. They seem to take the Gobbell’s idea to heart, i.e. if you’re going to tell a lie make sure it’s a bloody big one. In 1997 GISS showed 1880 to 1910 as a warming trend but now it suddenly becomes a cooling trend. Unbelievable fraudulent con tricks. So even Kempsey is near all those Qld locations? At last we know how Greg Inglis qualifies as a cane toad! BEST and Cane Toads; good combination. BEST is flawed. It found that UHI doesn’t exist and uses a flawed methodology. BEST uses a Jackknife method with a spatial correlation, height above sea level, supposedly to eradicate UHI, and NO time correlation. “Another way to think of it is if you have 5 stations. Say one is weighted approximately 10 times greater than the other 4 which are equally weighted. This would be the same as 10 copies of 1 and 4 other copies of something else. If you eliminate one station which happens to be one of the 4 and the weights are recalculated so that one station is say 10 times weighted to 3 at similar weights to the original, the difference in the temperature reconstruction would be about 1/14th of change from error rather than 1/5th as would be assumed by jackknife. John Kerry has gone down the full troppo fairyland path. Incredible garbage from the third in line to run the largest economy on the planet. Truly frightening stuff. Yet another new study finds that NATURAL ocean oscillations since 1850 were responsible for the rise in SSTs. What a joke these fanatical BS artists are and yet they still turn up here and yap about their unfounded nonsense. But ask them for a link and they disappear fast. But ya gotta laugh. Mann’s new study is easily pulled apart by Nic Lewis. Near the outskirts of Brisbane? ?????? Bengsston recants and tells all that University Reading is a very tolerant and understanding institution and all is well.Sign zee papers old man. I understand in a way, but Lennart should have shown some backbone.I agree with your position Jennifer on another site. As to Berkeley stations for Amberley, I noticed Casino AWS and Casino AP (now closed) are listed. These two stations are approximately 300m apart, same altitude and have overlapping temp data from 1995 to 2011. Despite the closeness, the manual station’s max mean was 0.55C/year warmer than the AWS and the min mean was 0.17C/year cooler than the AWS over that period. This gives a difference in the mean temp of 0.36C/year. How can they use stations many kms away to do adjustments when two nearby stations have such a discrepancy? If you view the Casino Ap data from GISS NASA you find quite a bit of adjustment in v4 to show a warmer trend. Even the BoM shows that Casino’ max mean has cooled by 0.8C during the past 30 years. The Amberley adjustments are all about minima, as seen in charted comparisons of ACORN vs RAW min (http://www.waclimate.net/imgs/amberley-acorn-raw-min.gif) and ACORN vs RAW max (http://www.waclimate.net/imgs/amberley-acorn-raw-max.gif). The obvious points where ACORN shifts min adjustments are 1979 and 1999. Putting altitude aside, how about average BoM RAW temps at the BEST listed stations within 50km of Amberley that had any records from 1942 to 1999? Ipswich 1942-93, Wacol 1977-79, Moggill 1969-73, Archerfield 1943-64, Mt Glorious 1971-91, Samford 1972-96, Qld Uni Gatton 1946-89, Gatton QDPI 1969-98, Brisbane RO 1942-85, Logan City Treatment Water 1993-99, Glenlogan 1973-86, Brisbane Aero 1950-99, Sandgate 1942-67. These 13 had an average RAW max of 25.49C from 1942 to 1999, compared to 26.59C at Amberley, but let’s not worry about that 1.1C difference in max and concentrate on min since that’s where the adjustments have happened. The 13 <50km surrounding stations had an average RAW min of 14.45C from 1942 to 1979, compared to an average 13.43C at Amberley, and an average RAW min of 14.21C from 1980 to 1999 compared to an average 12.75C at Amberley. So averaged, there was a 1.02C min RAW discrepancy from 1942 to 1979 and a 1.46C discrepancy from 1980 to 1999, with Amberley always the cooler. Using this logic, the easiest way to compare with ACORN adjusted temps is to subtract Amerbley's RAW records by 1.02C from 1942 to 1979 and by 1.46C from 1980 to 1999. This almost certainly isn't what the BoM did, but if the temperature of surrounding stations is relevant then it's at least one way of trying to figure out why minimum temps were targeted so harshly for ACORN adjustments. After those huge reductions to early temps, the average RAW min in the first half of Amberley's record from 1942 to 1979 was 12.29C and in the latter half from 1978 to 2013 it was 11.90C. It's hard work making Amberley warm up! But the good news for warmistas is that in the first 10 years from 1942 to 1951 the average RAW min was 11.91C and in the final 10 years from 2004 to 2013 it was 12.77C, a 0.86C rise in min. The hottest preceding 10 year period was 12.49C from 1950 to 1959, so the last decade to 2013 had 0.28C warmer min than any earlier decade … after slicing 1.02C off RAW in the earlier period despite indications the thermometers were already recording well below the average min at 13 <50km surrounding stations. New dry and wet bulb thermometers were installed at Amberley in 1997. New minimum thermometers were installed in Sep 1941, Jun 2007, Feb 2009 and Oct 2012, with replacements in Feb 2008, Nov 2009 and Nov 2012. Amberley is the largest RAAF base in Australia, housing about 4,000 personnel, once home to the F-111 and now the Super Hornet, and the Google Maps pic at http://www.waclimate.net/imgs/amberley.jpg gives a hint at artificial influences on the station's temp trend. The Stevenson site is to the right of pic, which is a bit of a classic for the timing of Google's satellite snap. Not that large passenger and fighter jets landing and taking off about 150m from the screen could possibly influence air temperatures! But what if ACORN adjustments did have something to do with all that jet heat coming off the tarmac, even occasionally when westerly winds blew it toward the screen? A 1978 study in Miami found what amounts to a 0.6C airport influence on min vs neighbouring stations (http://www.nwas.org/digest/papers/1978/Vol03No3/1978v003no03-Schwartz.pdf). Max were also affected but not as much as min. The neighbouring Brisbane Airport is also an ACORN station so maybe it's worth comparing its ACORN and RAW minima (http://www.waclimate.net/imgs/brisbane-acorn-raw-min.gif) and maxima (http://www.waclimate.net/imgs/brisbane-acorn-raw-max.gif). In Brisbane Airport's case, both min and max RAW have had a cooling trend since 1950 but both have warmed with ACORN adjustments, particularly min. If the airport environment has influenced ACORN adjustments, rather than or along with surrounding stations, it's forced pre-99 max down at Brisbane, where it was cooling in RAW, but not affected Amberley max where RAW was increasing anyway (possibly because of the nearby tarmac rather than climate). This site is on the grounds of the Amberley RAAF base, west of Ipswich. The instrument enclosure itself is bare ground (black soil) with natural grass surrounding. The site has been operating since August 1941. No significant moves are evident in documentation but the data indicate a substantial change of some kind at the site in or around 1980. An automatic weather station was installed on 3 July 1997. Manual observations continued under site number 040910 until September 1998." So the substantial change "of some kind" in or around 1980 might contribute to the ACORN adjustment shift from 1979. I love the detail. The average Amberley RAW min 1971-80 was 13.74C and from 1981-90 it was 12.78C, so there was a 0.96C drop in min averages. Yep, if "some kind" of substantial change caused recorded RAW min to drop by almost 1C, that must require a further downward ACORN adjustment to fix the problem. The average RAW max changed from 26.53C to 26.50 in those periods … i.e. no change, so it was specific to min. Hi Ian George, re Casino. I know of several places, (Bourke among them), where temps a few miles out on one side of town are consistently lower or higher than the other side, due to different soil and vegetation types. Most local farmers can give you the numbers, it is common knowledge. How the hell they can use towns hundreds of K’s away, as references, shows how stupid the whole process really is. As Jen says crying inside. The daily paper in Mildura made a big noise a year ago about the min temp setting a NEW high of 11c for the year. The average min for Mildura airport 1946 to 2013 is 10.3c and average high is 23.8c. The earlier Mildura PO is higher at 10.4 and 24.5 and a number of early years 11c or more as a min. Here is the airport record. But just 21 kms away the Wentworth PO record 1907 to 1967 record shows an average min for the entire period of 11c. So why then was such a big fuss made about the one recent year showing 11c at the airport? Here is that 61 year Wentworth record and all years probably used the Stephenson screen. http://www.bom.gov.au/climate/averages/tables/cw_047053.shtml Remember Mildura AP is just 21 klm away from Wentworth PO. Just adding to your comment re the record high minimum temp. According to BoM, there was a min high of 11.2C in 1972 at Midura AP which equals the 2009 ‘new high’. The highest min was 11.8C in 1942 at the Midura PO (using a SS). The long-term average min for the PO is 10.4C and for the AP is 10.3C – a difference of only 0.1C. Makes the 1942 record look solid. So didn’t the paper actually check the data? Ian have you got a link for those min temps in 1972 AP and 1942 PO? I can’t seem to find them for those individual years. Just read Bob Tisdales latest thoughts on Trenberth and his hopes for a big El nino JUMP to stop the pause. If you take away El nino jumps and and include UHIE you’re left with ZIP. What a joke. I’ve mentioned this before, but it’s worth repeating. Some years ago we had a day in mid-October which was extremely cold in the morning, so I checked the BoM reading on the internet when it became available in business hours. Sure enough, it was very close to the record min, which was set on an October 1, while the morning in question was, as I recall, the 17th. I thought it proved nothing but was of interest. It was so interesting I happened to check back later that day – something I would rarely do – and found that the morning’s temp had been adjusted half a degree. You have to guess which way it was adjusted. For starters: Historic sites face climate threats And I do not hang around on this site watching for the biased answers so I did answer but not right away. Buy a lifejacket while you can. The streets around City Dock in Annapolis flooded again Friday, closing the Spa Creek Bridge connecting the Eastport neighborhood with downtown for several hours. It is risky to live on coastlines but people do it anyway. Great analysis Chris; it is so obvious that ‘errors’ have occurred. Thanks for those links Ian. RLP the SL record for Annapolis shows no acceleration at all. No hint at all of dangerous CAGW SLR. Lots of places like this have suffered severe flooding for centuries and they should spend their money on adaptation and not waste billions on something they can’t fix by anti fossil fuel fanaticism. BTW Debbie is spot on as well. But don’t hold back, just tell us what YOU would do? When I was a kid, parts of Sydney like Beverly Hills and Fairfield used to go underwater. Low lying and no drainage, you see. Till the prob was fixed. Am I getting through, RPL? Trying to save you the cost of lifejackets etc. I must say, mean minima are so much an effect of night cloud cover that I would find it meaningless to use them as any more than the most superficial sort of data. 1994 was a dangerously hot year for my part of the world, 1950 was, of course, a big La Nina. Yet 1994 has close to the lowest mean min, and 1950 is close to the highest. Cloud, you see. 1914 is a year I’m glad to see the back of. In spite of much more cloud than baking 1915 it still manages the top mean min and close to the top mean max. 1946, while it had an extremely dry winter here (only the absolutely freaky 1895 was worse) was not that dry overall to explain such a low mean min. Of course, you have to know the how and when of the cloud and the rain in the particular year – and I don’t know. Stats are pretty poor things. I’m amazed when people want to process them into graphs and systems to prove some point or other when their weaknesses are so blatant. Don’t get me wrong, I like me some raw data. Mixed with commonsense they can’t hurt and might even help. Of course we need to look at what works and then build on those principles. RPL appears to be unaware that the problem of eroding coastlines has been around far longer than any influence that human activity and GHG emissions may have on SLR. A grand challenge to control the human influence on the weather/climate is highly unlikely to prevent coastal erosion in any significantly useful way. 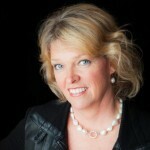 A good interview with Judith Curry by Quadrant magazine. And she is spot on. Another study shows lower SLR from 1953 to 2004 than the earlier part of the 20th century. http://onlinelibrary.wiley.com/doi/10.1029/2006GL028492/full I hope RLP reads this study. 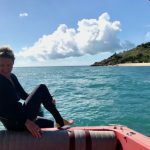 RLP’s first entry on this post asks whether we will still argue about SLR when the water is lapping over the Sydney wharves and washing houses away along the coast? Here is my post and link to the NZ and Sydney SLs from an earlier post on SLR. RLP can read the Hannah et al report for himself at the link to properly understand how nonsensical his comments are on OZ SLR. Here is my previous comment. Here is the 2012 Hannah et al SLR study showing four NZ ports. It shows that SLR is 1.7mm a year and thats 17cm by 2114 or 6.8 inches. That’s 14.6 cm by 2100 or 5.8 inches. Port Denison (Sydney) has been rising at 1.1mm year from 1940 to 2000. And that’s 11cm by 2114 or 4.4 inches. That’s 9.5cm by 2100 or 3.8 inches. Biggggg difference to Gore and Hansen’s 6 metres ( Pearman as well???) or Flannery’s 8 metres or ABC Science Guru William’s ( it’s possible) 100 metres. Gore and Hansen estimate is 60 mm a year or about 35 times the current rate. Flannery is about 59 times and ABC’s Robyn Williams is about 588 times the current rate. That’s using the 1.7mm year from NZ study not the 1.1mm year from Sydney. But boy have they got some catching up to do. I think the Bolter should ask Robyn back for another interview and find out if he’s changed his mind? Probably not, but that 1000mm a year estimate is a record. Certainly the type of science advisor that’s well suited to advise their ABC. The latter does NOT erode. This post from Rick Cina at WUWT is probably one of the best I’ve seen on seen SLs and lack of correlation to increases of co2. He includes many links to support his claims. Well worth a read. According to the latest IPCC report (2013), sea levels rose at a rate 1.7 mm per year, or at a rate of 6.7 inches per century, between the years 1901 and 2010. But we don’t see that. Instead, peer-reviewed scientific papers tell us that, from the 1950s to the 2000s, sea level rise rates have slowed, or decelerated. The rate of sea level change was found to be larger in the early part of last century (2.03 mm/yr 1904–1953) in comparison with the latter part (1.45 mm/yr 1954–2003). So, from 1904 to 1953 (50 years), CO2 ppm levels increased by ≈15 ppm, and sea levels rose by 2.03 mm/yr. From 1953 to 2003 (50 years), CO2 ppm levels increased by ≈75 ppm, and sea level rose by 1.45 mm/yr. Thus we can conclude that sea level rise decelerated by 40% during the same span of years that CO2 levels were increasing by 500% (15 ppm to 75 ppm), an inverse correlation. This establishes a strong lack of correlation between CO2 amplification and sea level rise acceleration. And if there is a lack of correlation between CO2 amplification and sea level rise acceleration, then it cannot be said that CO2 absolutely causes sea level rise acceleration. Further, it may be concluded that man-made CO2 does not cause accelerated rates of ocean heating, ice sheet and sea ice melt, or surface temperature heating. For the last 40-50 years strong observational facts indicate virtually stable sea level conditions….contradicting all claims of a rapid global sea level rise, and instead suggests stable, to slightly falling, sea levels. The analysis reveals a consistent trend of weak deceleration at each of these gauge sites throughout Australasia over the period from 1940 to 2000. However, long term tide gauges, recording sea levels worldwide, as well as along the coastline of Australia, and within the bay of Sydney, do not show any sign of accelerating sea level rises at present time. The paper shows that locally and globally measured data, collected over short and long time scales, prove that the claim of sea level sharply accelerating is false. 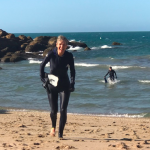 We revisit available tide gauge data along the coasts of Australia, and we are able to demonstrate that the rate may vary between 0.1 and 1.5 mm/year, and that there is an absence of acceleration over the last decades. 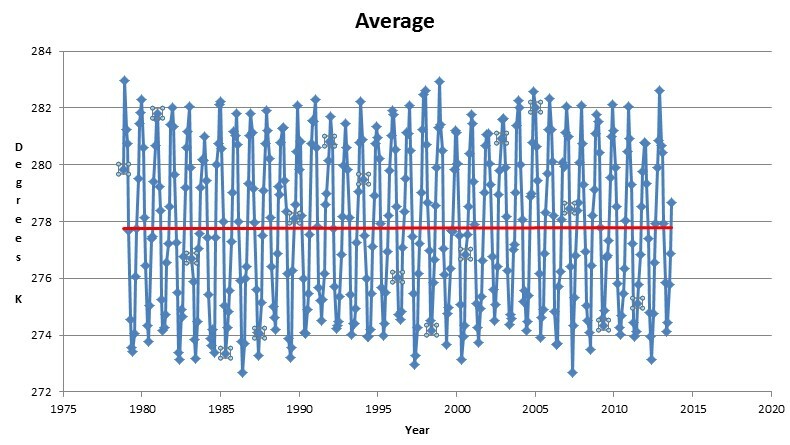 We analyze monthly-averaged records for 57 U.S. tide gauges in the Permanent Service for Mean Sea Level (PSMSL) data base that have lengths of 60–156 years…and 25 gauge records having data spanning from 1930 to 2010 are analyzed. [W]e obtain small average sea-level decelerations. Morphological and stratigraphical observational facts in the Sundarban delta provide data for a novel sea level reconstruction of the area. This sea level documentation lacks traces of a global sea level rise. This implies totally new perspectives for the future of Bangladesh. No longer are there any reasons to fear an extensive sea level inundation in the near future. We see ZIP correlation between increase in co2 and CAGW yet we will have to pay an extra 21.6 bn $ in 6 years to support Labor’s mess. Billions wasted for no change to climate or temp or co2 levels at all. Just ask Germany and the EU who have wasted 100s of bns Euros for the same stupid result. Thanks for that link, Neville. 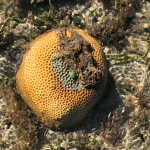 “When it comes to calculating long term global sea level means from tide gauge data, there are a number of problems. Firstly there is a bias in the distribution of tide gauges towards certain regions, notably Northern Europe and North America [Douglas, 1991]. Secondly there is the problem that not all tide gauge records are of equivalent quality. This can either be due to their location (being for example in an earthquake-prone region or an area of high glacial isostatic adjustment, GIA) or due to the quality of the instrumental record (being perhaps too discontinuous or lacking critical datum information to account for local vertical land movements). Sorry for the O/T Jen but to correct the ravings of people like RLP, when Sydney harbour has had about 2 inches of SLR in the last hundred years and SLR is not increasing, this paper puts SLR and CAGW in their proper perspective. Spot on Spangled, but don’t expect RLP to take any notice of ZIP correlation between increased co2 and temp or SLR or glaciers or weather etc. But when you look at the lack of correlation between co2 and temp for hundreds of millions of years this shouldn’t come as any surprise to anyone. Except silly religious extremists. In fact over those very long periods of time co2 and temp moved in opposite directions for millions of years. More BS about turtles is easily answered by this graph as well. Whilst the manipulation of Australian temperature data is of obvious concern of greater import is that of the long term temperature series from stations around the Arctic Circle as this is the area that Arrhenius predicted would show the greatest response to a doubling of atmospheric carbon dioxide – though as he claimed it would be at night and in the winter when temperatures in this area can reach -40C it is difficult to summon any concern! These BEST maps confirm the IPCC claim of substantial warming in the Artic area since 1880 but a detailed examination of the data shows that this is due to data manipulation, especially swamping out the long run series from John-Daly (with data confirmed in the BEST calculations) by stations in large urban areas where these is a substantial UHI effect or very short run stations that started up post 1960. Just taking the rural stations shows little to no warming trend at all. A good example from the BEST mapping is Sodankyla – an Arctic Research Station in northern Finland with which I am familiar. The BEST data show the raw data from 1908 to be flat but they manage to created a trend of 1.18 C per century from it. The situation is similar for other stations in the Arctic Circle, for example Bodo in Norway that clearly shows that, like Sodankyla and the others, temperatures in the 1930’s were warmer than the 1990’s though the scale of the BEST graphics does not make this clear as does that of John Day. That said, BEST are to be congratulated for providing the data in this form: including the raw data, as well as their analysis. This enable one to see that global warming is far from global and where it is occurring it is largely a UHI effect and in areas of little concern – as a some time resident of Scandinavia I would welcome 10 C warming in the winter when temperatures are currently between -50 to + 5 C! Read this from the Conversation. Apparently our high rainfall in 2010/11 has led to the drop in SL and CO2. Should have happened in 1974/75 but no mention here. Gotta smile. David Archibald and Chris Ollier will try to introduce some facts to the debate on SLR in Perth next monday. Thanks for that Ian. It also caused the big monster drop in this graph at Uni of Colorado at that time. That’s a big strong la nina gully to be sure. Ian G on 2010 rain and the drop in SLR. “Should have happened in 1974/75 but no mention here. Gotta smile.” The facts I introduce are not so funny. You might hypothesise a greater SLR impact from excess rain in the N hemisphere where there is more land to lag the cycle. And so it seems. The N hemisphere was about 50mm above its 1974/75 rain in 2010/11- the S hemisphere was about 50 below in 2010/11. Here is NASA and Josh Willis’s take on the 2010/11 la nina. This was written about in 2011. This was the strongest la nina for about a century and changed rainfall around the planet. The rainfall on land fell mostly over the Amazon and OZ. But NASA is wrong about melt from Antarctica adding to SLR and even the IPCC agrees that Antarctica will be negative for SLR for at least 300 years. ALL the models agree on this point as do the latest observations and SL many recent SL studies. Of course the greatest increase in SLR comes from thermal expansion, about 67%. In the 2007 IPCC report that was 23cm of the 34.5 cm total SLR and Greenland was about 3.5cm and Antarctica was minus 5.5cm. The total was therefore about 29cm after subtracting Antarctica. Fair cop, Bazza. But my reference to 1974/75 was to do with the impacts here in Australia. I should be more explicit. Most recent study shows no increase in global drought over the last 30 years. Just another important study ( like SLR) that doesn’t support the delusional fantasy of CAGW. Andrew Bolt recently called John Kerry an idiot and now Roy Spencer calls Kerry clueless. But what does that say about Obama’s science guru/expert Holdren? Or Gore and Hansen, Flannery, Williams, Mann, Kennedy prophecies for that matter? Dr Lennart Bengtssen gets stuck into the “pseudo science” behind the CAGW nonsense. He clearly states that it is impossible to predict future climate and he is very annoyed after being called “a world criminal” by one of the leading parasites running the wind energy fraud. He also notes that some of the jewish scientists working for the GWPF are less than impressed when they are labelled “deniers” by these disgusting fraudsters. Antarctic temps are always quoted in the MSM to imply that it is warming in recent years. Certainly the Ant Peninsula is warming but that has been the case on and off for thousands of years. But the 2005 Turner et al study shows that since 1960 Antarctica has been cooling. The warming trend for 1961 to 1990 is greater than for 1971 to 2000. And of course the Pages 2K study found Antarctica was warmer from 149AD to 1250 AD than at any time in the last 2000 years. Their study also found that Ant today was currently in a cooling trend. Here is the abstract from the Turner et al study. 2002) coupled with disintegration of several floating ice shelves (Vaughan, 1993). And in case there is anyone who cannot connect the dots, it means that the ice is melting due to global warming. not very slightly incorrect temp readings. Chill, Bob. Ice sheets collapsing are a symptom of ice sheets collapsing. As to the purpose of the publicity, it’s to distract us from the fact that Antarctic sea ice is at or around record HIGHS by exactly the same standard that Arctic ice is at or around record lows. Overall, there’s quite a lot of ice around the globe right now for some reason. Bob If you believe that you’ll believe anything. Just look at the study I just linked to above. We are currently in an Antarctic cooling trend since 1250AD and ALL the models used by the IPCC show Antarctica is negative for SLR for the next 300 years. And why do so many of the recent studies on SLs show a deceleration? But please tell us how to fix your non problem? Is it more billions $ wasted on even more wind farms, solar, or billions wasted on the purchase of corrupt and fraudulent EU carbon certificates or new nukes etc? And don’t forget the RS and NAS have just told us that there is zip we can do to change co2 levels for thousands of years anyway. But come on Bob be the first to show us how to mitigate your CAGW? There were Arctic ice deficits in the early 1810s and post 1920. A big temp plunge in the 1960s resulted in the high levels of Arctic ice in the 1970s just before we started the sat record. Is Bob allowed to know that? Do GetUp or SkS have a standard rebuttal? Anyway, global ice levels are presently ABOVE the running mean post 1979. Not that it means much, but I’d like to save Bob the trouble of hunting about for some breaking bits of ice – and maybe some subsidence or erosion somewhere in the tropics – to keep that “campaign” on its rails for a few more years. With a bit of luck, biochar salesman and Tom Cruise impressionist Christian Turney will be succeeded by a real scientist, one who visits the Antarctic to learn, like Mawson did – and not to prove the truth of a mad dogma. Bob here’s one of my links from the previous Morner SL post. As you can see world glacier retreat has also slowed after 1950. Of course warming at Greenland was 50% higher as well in the earlier 20th century. The Church et al SL study is supported by the Leclercq et al 2014 glacier study. They found that the strongest glacier retreat around the world occurred in the first half of the 20th century. http://hockeyschtick.blogspot.com.au/2014/04/new-paper-finds-worldwide-glacier.html Once again the post 1950 retreat has slowed, so where is the so called increased co2 effect? In fact observations prove that it is exactly the opposite. So how does that work???? The NEEM Eemian study on Greenland found that temps and SLs were much higher 130,000 to 115,000 years ago. Importantly they found that temps were 8C warmer than today and SLs were 4 to 8 metres higher than our present levels as well. But they also found that this NATURAL warming must have been much higher at Antarctica to raise SLS by that much during the Eemian. The much higher NATURAL temps and SLs rather stuffs up a lot of CAGW theories today and shows the futility of their delusions. Well, maybe Bob was just here to distract from the temp discussion, which comes to this: if they did it to Amberley, they’d do it to Australia. That Steyn piece is good but people like Bengtsson will continue to suffer indignities until they get support, financial and governmental, against the cowards of AGW. Cohers thay all seem to be cowards. They jump in here for a silly post or two but can never answer the pertinent questions. We post PR studies all the time showing modern warming and impacts???? are not unprecedented at all, but they just fall back on their fundamentalist religious dogma. Every challenge they throw out is easily knocked over, yet they still believe in their faith. And science doesn’t get a look in at all. More problems with the clueless MSM reporting of the latest study on so called Antarctic ice loss. More unbelievable ignorance from channel 7. But hey what’s new about that? The Pudsey et al 2006 study showed that part of the ice build up on the west Antarctic peninsula may only be a result of the LIA. They found that much of this area had a mid holocene break up, so once again the warming of this small area is not unusual or unprecedented. Re Co Q above, had a quick think and came up with three words – friction, pressure and ballance in that order, so here is my first promt for those following. Gav glacier retreat around the world has slowed since 1950 and WAIS is doing what it’s been doing for thousands of years. Read the science and the paleo record. And what has this got to do with so called CAGW? It certainly doesn’t show up in the deceleration of SLR in numerous recent studies either. Remember SLs were much higher in the earlier HC Optimum and were at least 1.5 to 2 metres higher only 4,000 years ago. Also Antarctica was warmer over most of the previous 2,000 years as well according to the PAGES 2k study. So where are the impacts from increased co2 levels? All observations show the opposite. That’s a nice paper detailing the different types of glaciers and processes which shape them gavin. It is also stark evidence that glacier size and condition depend on far more than what AGW can offer. It reminds me of teething problems with the satellite measurement over Antarctica; the measurements from the satellites showing rapid warming and it was heralded as firm evidence that AGW was real. Then someone figured out the satellite signal was penetrating the surface of the ice and recording the temperature within the ice which was warmer than the air temperature. Still the science is settled! Hmm, looks like distraction from topic. Discussion of corrupting the temp record making people uneasy? GetUp getting up? 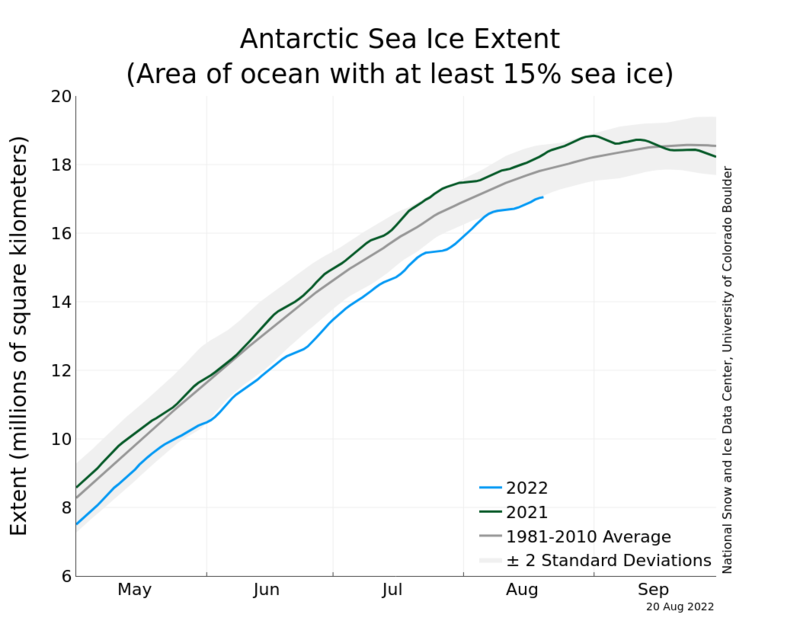 I mean, how much Antarctic and global sea ice do you need before the whole ice thing is seen as a blatant beatup? RLP ditto to you in my response to Gav. It’s old hat and has happened a number of times during the Holocene. SFA to do with co2 increases at all. Slower glacier retreat and SLR slowdown proves it in the early 21st century studies. But most importantly TELL US WHAT YOUR ANSWER TO YOUR PROBLEM IS? WHAT SHOULD WE DO TO FIX IT? This should be interesting ZZZZZZZZZZZZZZZZZZ. In a holistic effort which actually looks at more than one issue at a time, and in an effort to get back on topic, the reason why the Antarctic is warming in parts at a slower rate ( if indeed that is the case) is that the records are obviously being homogenised from the north downwards as part of the greatest conspiracy of all time. I would not be surprised if the Amberley trend was not of extraterrestrial origin as it has a role in space shuttle backup. The base has had a huge amount of development since it was host to Moth Minors in 1940 and now has Galaxy capability. If I was checking the Amberley trend, I would start by finding out a bit of the met site history – google shows lots of borrow pits around the site. Then I would write to BOM asking what went on and tell them you have a genuine research interest as you are investigating world wide changes corrupting temperature trends and you have not bothered to read any of the extensive literature on homogenisation because you prefer to feel arrogant rather than ignorant. There is no fix, it’s to late. Learn to live with it instead of denying it. Yes, I’d say there are some people very uncomfortable with the topic. They’re bristling. Ken’s Figure 1 really is an absolute hoot. They don’t like the trend so they do a single neat tilt. Nice one, warmies. The actual paper, if one actually reads it, merely confirms that ice sheets are moving as they have been for a very long time at an unchanged rate. The “collapse” is a process that will take many thousands of years- if it is in fact ‘unstoppable’. And the rate of change is steady, not accelerating. Meanwhile, the IPCC states that Antarctica as a whole is gaining mass and is off setting the relatively small W. Antarctica are you seem exercised about. Robert; as the senior measurement practitioner on here and having observed the Amberley thing drift without my help, I’m going to make just a few comments re the original topic and the framework it fell from. The idea that one ground station’s weather records can give us true trends in global climate shifts is just short of ridiculous. Any given region will have numerous surface anomalies including the built environment where temperature records were started. What we have however is the much larger volume of air called the atmosphere and it is the one unifying factor. Any station error analysis must begin with a greater understanding of such fluid dynamics. I say there is only one on board global temperature record applicable to the human period and it’s simply sea level v time and the range is directly related to our concepts of temperature and climate. In retirement I can be obnoxious and hassle the young practitioners re their product knowledge, adaptation and attitude to ongoing learning within their chosen discipline. But most of us should be capable of moving on from any start point. To become a leader, I ask the willing exponents to supplement their physics with home grown routines for self-checking thus establishing their own platform for measurement and program certainty. For example by merely looking out my window the entire Brindabella Ra skyline fits neatly between any pair of 2” horizontal slats in the venetian blind, i.e. the Earth is flat! Moving on can demand some faith in both our rising graduates and their UNI. As a current client of LINAC technology I see instrument development at its best and surrender to the program such as it is. Now let’s make this point about the recent budget, medical research without the other disciplines is sheer nonsense. Although I and recent partners have worked in direct support to medical research it was our Chief Scientist who said on our 7.30 Friday night that it wasn’t a medico that built the MRI and neither he nor colleagues were consulted prior to the co-payment fund announcement. We live buy our wits to the end. Looking at both ends of the mainstream populace these days, it’s not wits that’s causing the problem, it’s taxpayer funded entitlements. If they stuck to living by their wits they’d be much slimmer. Bob Manton May 22nd 8:40. I apologise for not noticing your comment until now. Perhaps it was one that was held in moderation that Jen mentioned earlier? I agree that wharves etc are not the same as a natural coastline. . .but Bob. . .I seriously question your assertion that they don’t erode. I would suggest that you check that one. If they’re not maintained they do indeed suffer the same fate. The forces that cause the erosion of coastlines do not discriminate. There are examples all over the globe of wharves that have succumbed to those forces. I also suspect that Robert is correct and there is an effort to ignore the actual topic of this post. Anyway, as I was saying, they just took a slab of the record and tilted it. What sophisticated homogenising measurers they must be. Definitely the work of senior men. Leaders. The funniest thing? It was a record of minima, and it would have been perfectly natural to have lower minima in a period of higher maxima and reduced cloud cover. Do these climate experts ever put their heads out of a window? They didn’t even need to fudge this one. Well 10 out of 10 to RLP for admitting the bleeding obvious. You are correct, there is SFA we or the entire world can do to change the climate or co2 levels or temp for thousands of years. You’re dead right. Luke ,Gav or bazza haven’t been able to admit this simple fact even after years of being belted around this blog. As I’ve stated years ago a kid of five should be able to work this out using simple logic and reason and very simple maths. And it wouldn’t have mattered whether we started down this idiotic path now or thirty years ago. Just look at co2 increases since 1990 and you’ll understand that most of the increases have come from the non OECD. Just simple maths once again and the projections for the future show the big co2 increases will come from the non OECD as well. So the sooner we abandon this delusional nonsense of co2 taxes and wasting countless billions $ on corrupt Co2 certificates and clueless solar and wind etc the sooner we can concentrate on more R&D and adaptation. Haven’t changed much, have we, all rhetoric no math. Like Gav says, albeit a bit cryptically: “it’s simply sea level v time”. Who cares about a sea level rise which began (this time) in the late 1700s and has decelerated somewhat in the last 150 years? Much more important to talk about the subject of this thread, namely, dodgy adjustments to the temp record. We should frame copies of Ken’s figure 1. So blatant, so funny. Don’t like the slope of a trend? No need for micro-adjustment. Just put a brick under one end. I have to agree Robert. Much ado about OT here. Dunno. . .but it does appear that alarmism has moved from atmospheric measurements to SLR . . .possibly because of inexplicable anomolies such as the one Jen highlights here? Robert and Deb, alarmists like Gav thrive on unquantifiable evidence that people like Ken Stewart can’t point to and show their error. Gav much prefers his melting ice tucked away somewhere in the world [preferably a far distant Pachauri glacier] or looking at coastal erosion and screaming SLR. Not really into relevant details, our Gav. Well I’ve tried for years to get through to the fools the very simple maths that underpins their mitigation of CAGW fraud. This is indeed 5 year old kid’s stuff, but here I’ll try again. Here is a link to the chart from the EIA showing co2 levels and sources since 1990 and projections to 2040. Now if you can’t understand the futility of the OECD countries trying to mitigate your CAGW by all the fraudulent schemes tried to date, then that’s your problem not mine. Can it be dumbed down any further than this? We can argue all we like about one station (Amberley) but my post was about what the adjustments, whether justified or not, have resulted in across the whole network, and that is two thirds more warming than the ‘raw’ data shows. An adjustment was definitely warranted at Amberley around 1980, but the amount, resulting in a trend of +2.52C per 100 years, is questionable. so Ken , why don’t you just go and publish a paper demonstrating as well that you are on top of the extensive global literature on this topic and why who cares about one outlier in a hundred anyway. Thanks bazza you’ve just proven my point, but unfortunately I can’t dumb it down any further just for you. At least RLP understands it’s all BS, but you haven’t even progressed to his first base. Just a hint bazza, we all know why you don’t respond and it’s because you can’t. OH that’s unless you try changing the numbers AGAIN. The conceptual difference between BAU and the counterfactual????? I would love you to demonstrate that to Neville and everyone else. BTW. . .are you implying that Ken’s work is invalid simply because he hasn’t ‘published’ it? The way things are going, Debs, I’d think a work invalid if published. Such times we live in. I understand why you said that Robert but I don’t entirely agree. The validity of any work needs to be judged by a number of factors and publication can certainly be one of those. The irony in Bazza’s comment is he is sort of advocating a form of BAU in research In NRM which is proving to be ‘counterfactual’ & counter productive in developing sensible public policies in NRM. It looks like the satellite temp data sets are diverging even further from land based sets. Big surprise NOT. Good to see gavin back and in scintillating form. What a conceit from Cohenite claiming in relation to Stewarts unpublished paper “IMO BOM introduced ACORN in response to this paper “. You gotta laugh falling for the oldest fallacy – Post hoc, ergo propter hoc. Oh dear, bazza goes Latin to camouflage for lack of substance. bazza: “who cares about one outlier in a hundred anyway”- Apparently I have to spell it out more clearly for you. Across the network (I looked at 83 out of 104 sites) the net effect is a two thirds increase in warming trend. Not talking about outliers, not arguing one example against another. Many sites have been cooled, many have been warmed, but the result is strong warming. Regarding the literature on homogenising, while I wouldn’t claim to be on top of it, I do have a reasonably good understanding of the main methods used by GISS, Hadcrut, and BOM. In this analysis I assumed nothing about the adjustments but accepted them at face value, merely looking at their overall impact on the temperature trend. No cohenite, I don’t claim Acorn was introduced as a result of my work. Here are some genuine scientist’s rebuttals to Obama’s delusional and extreme NCA report. Ya gotta laugh because all they had to do was quote some of the more sensible recent findings of the NAS and IPCC 5th reports. If the US sec of state can be described recently as an idiot and clueless surely the people involved in compiling this NCA report are in the same camp? Why should he get all the blame? And as we’ve shown repeatedly their co2 reduction cure doesn’t even pass a simple kindy maths test and the paleo record disputes their findings as well. Plus the earlier pre 1950 USA temp records. If Bazza wants to sneer at and dismiss your work, he needs to demonstrate why he thinks it’s invalid. So far there is no substance to his comments other than a weird and ironic loyalty to a form of ‘counterfactual BAU’ in the ‘publish or perish’ fraternity. I know Ken, you’re far too modest. I was just yanking bazza’s chain and he flushed. I think he just beat your paper being published but the paper had been submitted before that. Anyway, no doubt the BOM had good reasons for replacing the HQ. With regards Ken; I read your posts via word press and found it well presented on the whole. However let me return to the fig above for the bulk of my criticism. I did think of making a more private statement of concern but there in no direct email and anything word press is permanent and I presently too sick to be bothered. So here is my platform in short form. 1 milestones in climate research; the geo phys year, 60’s analogue recordings, 70’s platinum RTD’s, data logging, digital techniques, data mining, international MOU’s on developing new data points via evolving satellite technology. 2 the trap with old weather station records, none of the above applied regarding solar, geothermal whatever energy balance. 3 the max – min daily temp recordings can’t be used for temp trends because of numerous untracked instrument discontinues. 4 even the best U Hg in glass tube thermometers had varying degrees of zero error but mostly around one scale graduation that required a direct comparison of both columns at any reading ie everything could be a bit one-sided up or down depending on your temp side. So we can go seeking zero errors, +/- 1C for a start between companion stations. Getting a fix for that generation of readings is a bit more difficult. 5 the concept that daily max/ min temp recording gives anything much about our constantly varying atmosphere, land surface temp or for that matter, oceans with out grounding from an independent process is wildly enthusiastic. From a process control background I can suggest we don’t use max/min recording for any continuous variable including temperature. Imagine driving out on the highway for a week with all instruments indicating only the top and bottom of their range. Gav, with all those hotshot instruments have you come across any temp increase when you hit the bitumen yet? This is probably the quote of the decade from the WMO. Now we know these fools have been fooling the people and themselves about CAGW for years. Gavin, as I said in my post regarding what our temperature record is, “no one knows for sure”, so I have to agree with you about maxima and minima. They give a rough idea but no more. Ken, on the ABC these days they give the temperature hourly and then tell us how far above or below “normal” that is. The ABC luvvies only seem to tell us though when it is above normal. How can they give us that figure if the long term record didn’t use TOBs? What about this little gem? I could go to the local pub and start a conversation about this Autumn and get exactly the same sort of info. . .for free! IMHO. . .Even more ironic is that in my patch, which is southern NSW (and I can also safely include much of Victoria), May has not resembled what has happened on the NSW coastal fringe. From May 1st through to about May 10th it was alternatively cold, foggy, sleety and wet (ie very winter like).. .and we needed to fire up our heating. After that for approx. two and a bit weeks it has been balmy and sunny (but not alarmingly hot, just nice Autumn weather). It’s still May, and yesterday we have had another 13+mls of rain (depending on where you are), and it is now once again cold and the heater is fired up again. If I average the weather for May 2014, it will not indicate anything whatsoever out of the ordinary! But of course. . .once again typically. . .a few crops (like apples) prefer an early dry, cold and frosty snap. . . and that has not been forthcoming for them this year. That’s often my issue with this alarmist focus on averaging weather and particularly temps state wide, nationwide and globally. It’s mostly just an interesting statistical exercise and just another way to have a conversation about the weather. There are always winners and losers, especially in a climate as variable as Australia’s. . .I am often amused that the ‘environmentalists’ have become more obsessed with talking about the weather than farmers are. Yes Debbie, I remember early May. I had to go down to some of that NSW high country to check out the wildlife there and before I left the temp was 0c but with the westerlies the apparent temp was -9c. Been very hot for May up here. That’s the part the climatariat hope we notice. The part we aren’t supposed to notice: this is the eleventh hottest May on record (average to yesterday) around here. Hottest was in 1916. Driest May was in 1957. Hottest autumn 1914, driest autumn was 1895, which was followed by an impossibly dry winter. If those awful 1895 conditions were to be repeated now, they would no doubt be called “unprecedented”. Because that’s the way the sham works, isn’t it? That does appear to be the way it works. Weather gets conflated with climate, the IT section plays around with averages and then the PR department reports it like some sort of exciting sporting event. Most of us out here who live and work in the real weather/climate/environment year in and year out just make jokes about it now. It is amusing that the day after that piece in the Conversation, the actual weather then changed and now we have had snow on the Alps, added moisture for all the crops and it’s very chilly. It’s also ironic that Vic has just announced an ‘environmental watering event’ and now the highly uncooperative weather has gone and done it anyway without any need to waste valuable productive water resources. Or to put it bluntly, it’s an expensive and wasteful exercise that looks more like a ‘feel good’ PR stunt than anything else. Ken & Co; I do respect your inteligent responses (free of political rhetoric) and am prepared to chat off line on virtually any related topic here that dosn’t involve writing or math. Are you trying to scare me Bazza? Last year the forecast was 80% for wetter than average for winter/spring in eastern Australia. .instead we had a serious drought for large swathes of NSW & QLD. That 80/20 forecast also contributed to NSW water management authorities wasting precious water resources. Because we have had such an awesome Autumn break, the subsoil moisture is pretty darn good, the crops have had the best start in ages and even if the rainfall is below average in winter/spring . . .as long as it falls in the right timeframe. . .we will be OK.
Below average does not necessarily mean a drought does it? BTW? How much above average were all those 17 Summers? Is it an alarming amount outside error bars and adjustments? I also meant to ask you why you thought your 17 Summers stat was relevant to a discussion about Autumn and particularly May? I seem to recall you lecturing me at some point that ‘it’ was happening more noticeably in the warmer minimum temps in the cool seasons? No offence, but that ‘it’ is starting to become as elusive & variable as the OZ weather. “It”‘s called weather, bazza. Just read this and relax. Robert, where is up ‘here’ for these May records in the past? “A few years ago, talking about weather and climate change in the same breath was a cardinal sin for scientists. Now it has become impossible to have a conversation about the weather without discussing wider climate trends, according to researchers who prepared the Australian Climate Commission’s latest report. Only in UN-IPCC ‘climate science’. Not quite. 2001 and 2004 break that cycle as shown on the BoM’s time series here. Cohers, I’m near Kempsey. We had our ten hottest years (mean max) before 1920. Except for 1993 and 1994, our driest years were way back in the record. But, as it can’t be stated enough, eastern Oz was a drier place before 1950 and northern Oz was much, much drier prior to 1970. We actually had better rainfall in the whopper El Ninos of 1982-3 and 1997-8 than in the super x 2 La Nina of 1916-18. Really. I don’t know why people keep threatening NSW with catastrophic drought when we’ve already had plenty of it. There’s reason to believe the late 1830s were even worse than 1902. As for the spring fires which were supposedly “unprecedented” last year, northern NSW was alight even before winter could end in 1895. So if we dry out and swelter then burn in the coming warm season I won’t like it one bit…but I won’t be surprised. Robert; get rid of your standing dry grass, blackberries, bracken and scrubby knolls above you regardless of “our” predictions. handjive of climatefraud.inc: Get your teeth into the substance of this, it’s appropiatly reviewed backround for that local 2013 position you quote above that’s hardly news now. Ian, I suspect you are the only inmate here who does research – true – 17 is for annual which in theory is less variable than a shorter period. Summer is only 9 years of above average mean temps and that would be a one in 500 chance if there was no trend. I was getting Debbie excited about the 2014 autumn temps coming out Monday. She may not know that almost all the major crook years for the wheat industry nationally have been El Nino years but regionally it is patchy. Variability is much higher for shorter periods and smaller areas as even Robert exploits. Bazza, I suspect you may be the only inmate here atm who hasn’t yet figured out that hand waving and alarmism over NATIONAL temp averages is not proving to be a useful risk management tool for people in my industry. Sorry to disappoint you. . . but at best, I am merely slightly interested in the 2014 Autumn temps coming out Monday. I am not in the habit of being ‘excited’ by BoM publications about NATIONAL average mean temps. BoM are actually supposed to record weather and seasonal data aren’t they? What do you assume I would find particularly exciting about the data coming out on Monday? BTW. . .do you think you have explained something that is ground breaking news with this little gem? Anyone who thinks the extreme events of 1895-1896 are just a case of small-order exploitable variability…just check the loss of life. Only the heatwave of 1939 (La Nina, bazza, remember? ), Australia’s most lethal natural disaster, killed more, and only by one person on the official count. Given population, the earlier heatwave was probably worse, and that’s not taking into account the huge winter/spring fires in NSW which came before. This is not to downplay eg 2009. I’m sure some alarmist in the future will want to pretend 2009 never happened – or only kinda happened. Manipulators hate history. Gav, I get the impression that everything which runs counter to the warmist faith, even the barest facts of great climatic events like those of 1895-6 and 1939, is blog noise. The rule seems to be if it happens now it’s dangerous trend, if it happened long ago it’s variability or anecdote or story time with Uncle Robbie. I’ve recently crossed swords with not one but two American “experts” who have been beating up the present SW drought in the USA as some kind of freak due to global warming. When probed, neither expert seemed even aware of California’s history of drought and mega-drought. One did not even know about the Grand Pluvial which ended California’s super drought of the early 1800s. Yet these are enormous climatic events, impossible to ignore. Not to know of California’s historic and pre-historic tendency to drought is an intellectual catastrophe and far too common among those who dogmatise the most. What kind of experts are we breeding? Deb, I was thinking you or maybe Rob would pick up on the inverse problem – there are a lot more El Nino years than major crook years for the wheat industry. Uncle Robbie; “pluvial” flooding US or Au is generally associated with cold, very dry windy low evaporation periods of glaciation, bit off theme hey! BTW a local couple with their kids and my camera are touring the deserts and canyons on their way to a medical expert training conference right now. Another lad is just back from NZ meetings re national data programs, the other lad is busy rolling out national cloud network systems here. “What kind of experts are we breeding?” the best, with ground truth by me. To be honest, I am not very interested in your thinking about what I might or might not pick up from whatever . Most of your commenting bears a remarkable resemblance to John O’Brien’s poem ‘Said Hanrahan’. It’s all doom and gloom. “bears a remarkable resemblance to John O’Brien’s poem ‘Said Hanrahan’. hahaha well said Deb…applicable to most environmentalists I would say. Here’s a challenge. Find a station anywhere in Aust that has had a month like Bourke did in 1896. I don’t think that could be called ‘blog noise’. Fair dinkum, I think this AGW has driven people mad; unless they were nuts to begin with. further proof cohenite has no idea. Come on Cohers, give us your summary of what you conclude from the graph of May and annual temps. Bazza, I take it you think the warm May in Australia proves CAGW but the cold records elsewhere around the world are irrelevant? The lack of global warming for a considerable period of time according to all data sets doesnt count but our unseasonably warm spring does? And the evidence provided by Ken about adjustments is also irrelevant because?…it doesnt suit your meme??! He seems to have made a pretty strong case by assessing lots of data…not one site so he has not cherry picked anything. Time to wake up I would say and admit there are doubts. I Know its hard to admit when something is wrong when you have fought so vociferously about it for so long. But real men admit when they are wrong…or at least when they may be wrong. Don’t you think? For starters Newcastle Nobby is a highly maritime station so the trend since 1970 is about the same as SST. It should not take much common sense to realise that a maritime station will respond to a hot spell differently. “Temperature data prior to 1910 should be used with extreme caution as many stations prior to that date used non-standard shelters”. Max and min temps for Nobby for May and for Annual are useless prior to 1900 because of obvious inhomogeneity. Max temps for May and Annual show a clear upward trend since about 1970 of about 1C, roughly consistent with the SST trend off NSW. Min temps for Annual also show about a 1C upward trend. May is about flat. Ian; seems the spooks have clobbered that link, but I’m hapy to look at your figures sometime soon. Ian, such a high and sustained temp for January, even for Bourke, would seem incredible…but we know the overall death toll for that heat event, and it’s all too credible. Far hotter than 1939 at Bourke, and the death toll almost as high when there were fewer people and less monitoring of population. Even where I live, 1895-96 should stand as an example for all time of what one needs to be ready for. Sadly, our climate “experts” are more likely to ignore such events or explain them away. And when similar events do occur – January 2013 Bourke temp was getting right up there – expect to hear that magic word of manipulators: “unprecedented”. Strange times, strange intellectual climate we live in. Robert, “strange intellectual climate” sums it up well. The West, in the old days was almost entirely “young man’s country” and they endured incredible privations and relished them. That was the spirit of the time. Young, fit men can endure and enjoy incredibly difficult situations if they have the right philosophy and when it is almost a competition to see who can endure the most then what’s a bit of warm weather? But even with considerable percentages of older and less fit people dying, modern “intellectuals” just don’t get it and would adjust them right out of the picture. Ian; Bourke in 1896 is a big challenge because we don’t have any means to ground truth those old weather records with regard to actual temperature at any given time. Principal reason there is no other weather station within cooee. Secondly nobody today can reconstruct that station or running temperatures with any certainty without a vast amount of other relevant data from that period. Thirdly, I can’t give credit to posters who have not yet realised after all this discussion that old weather records by themselves do not give us a platform to compare “real” temperatures, then or now. For starters, how do we get time of day from the max/min markers? It was at best a ”hollow” recording system without any scientific error checks however faithfully done at the time. Finally; after having done much measurement and system analysis, I’m looking for all comments that stem from a deeper understanding of energy calcs, i.e. the nonlinear multi-dimensional methods from physics, engineering and communications, because I admire so much the work of others in this sphere. “There — but only there — I must take issue with you. These climate fanatics are not thick, in the IQ sense, at least. Many of them, perforce, are extremely good at rationalising their positions. Their problems are emotional, somewhere along the spectrum of infantile narcissism, lack of self-awareness, to full-blown sociopathy. Because they think so much of their own Self, they are unable to properly relate to Others. Empathy and insight are utterly lacking, and they are propped up by detached intelligence, which is why so many of them end up in the ‘clever words’ industries — journalism, academia, PR/marketing, and of course, politics and bureaucracy. Poor Willy seems not to have parlayed his written skills into any kind of paid position, so he remains a free Willy, peddling his opinions around the place to gain attention. If it had only been Bourke in 1895-6, with its “old weather records by themselves”! Here’s the warning to us about the climatariat. If they are as determined NOT to know about something as significant as our second worst natural disaster (possibly our worst), what else are they determined to ignore in the advancement of their mad dogma? We were in one way fortunate to face the worst effects of the monsoon failures of the early 1790s, when killer conditions in India http://en.wikipedia.org/wiki/Skull_famine found an echo in Australia, just as in 1896 http://en.wikipedia.org/wiki/Indian_famine_of_1896%E2%80%9397. We were given, at the nation’s very inception, the chance to know the worst and prepare for the worst. It is a real disaster that we have an entire community of bogus scholars and “public intellectuals” trying to stifle that knowledge in 2014. You don’t face probs like the heat/fire of 2009 by pretending it’s all new. In 1967 and 1939 people were pretty sure nothing was new and worked to survive. What’s changed between Black Friday and Black Saturday? What changed between Mawson and Christian Turney? Why are we now being forced to tote a burden of dogma, with science obliged to watch its back and reinforce the dogma rather than just find stuff out? Gavin, ok then based on your desire to not use the old records then we should only rely on recent satellite data? If so is it not at least a little concerning to the theory of CAGW that over that record we have spent a considerable proportion of that time with no change in global temp? And why does so much of the old data seem to be adjusted down and new data up? That is after all what the findings of Ken actually are for Australia? Robert; “we have an entire community of bogus scholars and “public intellectuals” . So, I can dismiss the rest of your rhetoric hey? C’mon man you can do better than that! Toby; the old weather records treated with respect can remain part of global temp data. Ken I suspect will respect my view. Rainfall is the hardest thing to fudge. Although gauges only tell a part of the story, at least it’s an accurate part. What’s interesting about Bourke is that its driest year (at least by the newer location) was very recent, namely 2002. However, most of the lowest readings (5th percentile), going well back into the 19th century, were pre-1966. What does this tell us? That we need to be ready for some pretty bloody dry weather from time to time. If it can be dry in 1929 it can be slightly drier in 2002. And if it can be dry in 2002…oh, well, I’m sure Aussies are still able to work out stuff like that. By the way, just because Bourke copped its biggest monthly drenching in 1874 and its biggest annual falls in 1950, it doesn’t mean all that can’t be exceeded either. You see, there’s no rule to say that something can’t be exceeded. Keep any record for long enough and it will be exceeded. No doubt some impressionable doofus back in 1929 thought the local drought meant the end of rain forever. 21 years later…squelch! Btw, during the 1896 heat there were various reports of shade readings over 50C, in Wilcannia, White Cliffs and Brewarrina. Much of what we know about the temps, deaths and evacuations comes from the Melbourne Age of the day, ironically enough. “the old weather records treated with respect can remain part of global temp data”…yes Gavin, but only when they suit the global warming meme? Seems you’re right, Gavin, about the spooks. This is a cut and paste of Bourke in Jan, 1896. Try Wilcannia and Walgett (both ACORN stations and within cooee) – both extremely hot with +40C means. Broken Hill was 5C above average for that month. With people dying from the heat and being transported to cooler climes, I don’t believe this is ‘blog noise’. 12 Feb 1896 – THE HEAT ON MARRA. Yes Robert. . .of course. Records get broken all the time. And it doesn’t only happen in the weather/climate. We’re still puddling out the rice here. . . Since it was announced in 2010 that the trend is for drier Autumns in SE Aus, we have had the opposite occur. The next 3 were the wettest concurrent on record and this one is also very wet. Seems like the weather/climate isn’t particularly interested in conforming to these trends? It was very wide ranging heat in 1896. In Qld, the postmaster at Cunnamulla reported to the colonial secretary a temp of 123F on the 23rd. He said the average from the Ist was 114F. 120 was reported at Mildura. Melbourne got to over 108 degrees, though the record then was 111 from 1862, and there had been a couple of 110+ readings from 1876. Temps don’t explain all. Not nearly. The winds were reported as being from the NW in Melbourne, and if that’s the case for the heatwave generally it would explain the death rate. I’ve been in searing heat in 1960 Sydney and up here in 2004, but the worst heat is the kind that’s boosted by a spring wind pattern in high summer. We copped that recently and the first fleeters copped it 1792. Nothing worse. You could be right about the wind Robert. I’ve worked in 122f [50c] shade heat near Haddon Corner in still conditions pumping water from bores to water stock with an air-cooled diesel because the windmills weren’t working and it didn’t seem too extreme but working in a 40 knot wind at 112f was not as “pleasant”. Families who have lived for generations in those places know all about those temperatures. A good response Ian. Now lets do a linear check on these peak markers by throwing in your other sites, side by side for Jan, 1896 and it would be worth seeking similar events – stationary heat waves that followed. Amberly later hey. Btw; you guys are doing the work now cause I need my bed. It seems “old” data can only be trusted when it supports the warmist position – so much certainty about the past when it suits – think about the idiotic demands to restrict /reduce temperature to 2 degrees in order to return to pre-industrial revolution temperatures. Nonsense! Unfortunately, only 2 stations Bourke and Walgett have daily temps for Jan, 1896. However this summary should suffice (these 4 sites are the only nearby ones that have data for that period). Here are each site’s monthly mean for that period followed by its long-term Jan max mean and comment. Bourke – 43.4C (36.3C) Highest Jan on record. Broken Hill – 37.9C (32.4) 3rd highest on record after 1898 and 1939. Cobar has daily records going back to 1881 but none for Jan, 1896. Tibooburra starts from 1910. And these people actually talk about sceptics as though they have no right to exist. Can you imagine what trouble the warmists would be in if we didn’t? Ian; I have been trying all day to compose some decent text in respnse to your last post but I’m failing to complete anything between interuptions. It has to be direct contact by ph from here on if any one is prepared to go the distance on those finer points of early temp recordings, their analysis or even my concern with blog noise on these important subjects. One or two here should have access to my ph email etc. Sorry for any delay. I understand that the 1896 temps were not taken by a SS but the point is the temps would have been very hot and they are consistent between all the nearby stations. People died and many were transported to cooler climes. The Federation drought was real and resulted in the lowest recorded rainfall in 1902/1904. There may be a few degrees here and there one could contest but there has been nothing in the past 30 years that have come close to 22 days straight of +40C in Bourke (17 in Jan, 1939). My point is that these past extreme climatic events are buried to seem as events today appear unprecedented. Ian; for anyone to do this weather station record review properly, they must first empty their mind of all jargon, rhetoric, whatever then find the most v least likely scenarios before concluding. From your Jan 1896 max readings for Bourke we see many close to any ground station max at or about 50C. From your next post re other stations I have no confidence that Bourke could bake the cake ahead of others in the region either then or now and I maintain a cooee on this. Do the work and find a triangle of like stations that supports the Jan 1939 Bourke event then ask why is Bourke burning more? The personal platform for analysis is the most likely source of misunderstandings. For me, the universals must lie outside the constraints of language and be supported only by the concepts evolving from science, the physics and maths also models that support future learning in the nature of all things commonly experienced. The long-term Jan max means for prominent stations around Bourke are thus. Bourke appears to ‘bake the cake’ compared to nearby stations. Bourke, Cobar, Tibooburra, Wilcannia and Walgett are listed as ACORN stations. Does this give the temp means credibility in your eyes? As for your other comment re 1939 – here’s what ACORN adjustments do to the temp data for that period. So Bourke, with the highest mean and raw temp for Jan, 39 goes from first to last place. Measure me all that, and adjust a bit if that’s your hobby. But this is stuff that happened. It will happen again, and it will kill again unless we are wealthy, reliably powered and nicely air-conditioned. What made the 1896 event so lethal was likely the wind direction as much as the heat. It was, after all, the beginning of the Fed Drought, and the somewhat more humid conditions of the previous fifteen years in western NSW would be gone till 1950. No matter how sciency you think you are, you still have to use your loaf. And rhetorical complaints about the jargon and rhetoric of others just won’t cut it. Don’t like jargon and rhetoric? Then don’t do it. I was not the one who wrote about “models that support future learning in the nature of all things commonly experienced”. Et cetera! Thanks Ian. That really is the point, and it seems to me to be a compelling reason to have a constantly modernised, abundant, affordable and reliable electricity supply. We should settle for no less. We should then help the rest of the world to have the same. That sentence of Gavin’s elicited a similar response from me. Highly ironic. You don’t like jargon and rhetoric Gavin? Perhaps you might consider pointing it out to the enviro movement including the branch that has hijacked the weather. I hope you meant to point out the ABC piece you linked was a very good example of loosely connected and basically meaningless rhetoric, jargon and statistics? I hope you also meant to point out that it was just a piece about the weather and mostly irrelevant to the point of this post? Thanks Robert and Debbie. I believe I have answered all the main points that Gavin makes about nearby stations but it doesn’t seem to be enough. Your points above are spot-on. I wonder if Gavin would trust the new May max mean temp for Sydney Observatory for May, which has just been heralded, given all he has said. Sydney Obs has the lowest long-term May max mean for all Sydney stations yet was warmer than all other stations from Mascott to Penrith. Will the BoM adjust the SO’s record down to be more consistent with surrounding stations? Another interesting point – the previous record for SO was set in 1958 but been adjusted down by ACORN from its original 22.7C. But, get this, the 1923 data has been adjusted up to 22.7C. So raw data has 1958 as the May record but ACORN says 1923. But the BoM uses the 1958 figure in their monthly Sydney summary. Wasn’t the ACORN data, the ‘Rolls Royce’ record, good enough? For those that are deluding themselve that sea level rise is a non event…..
On May 6, the Obama administration released the third National Climate Assessment, and President Obama proclaimed climate change no longer a theory; its effects, he said, are already here. This came as no surprise in Norfolk, where normal tides have risen 11 / 2 feet over the past century and the sea is rising faster than anywhere else on the East Coast. Does it cross your mind that local levels which rise faster than others can’t be the effect of general rises? By the same logic, or lack thereof, Stockholm would be proof of FALLING sea levels. Rest easy though. Sea levels are not falling. They have been rising since the late 1700s, a bit sluggishly since the 1860s. I’m not saying that development of the East Coast has been responsible, because it hasn’t been. Of course low-lying cities will be affected by sea level rises, and it’s been obvious for more than two centuries. Happens after every ice age. Duh. Can’t leave this thread alone for a minute, before it slips back to prowling, growling, dogma repeating cronies. Back on deck again but unofficially cause it’s night time here. I have been rediscovering the old test for dehydration after sleeping and it’s acute when your tongue is stuck fast in roof of your mouth. Dryness in my case occurs without heatwaves or wind. Ian you disappoint. Just when I thought you were going so well on my theme of bunched weather recordings within cooee giving us more hindsight to past events you jumped back into line. 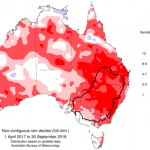 Deb; my last link was about defining heatwaves past and present in a scientific manner for the first time with regard to Australian weather patterns however the animated map gives much more. Here is clear evidence of one of my key assertions in contributions over years on this blog. We can put a hand over any bunch of weather stations of similar location and altitude and get the same temperature for a particular time of day in all regions of Australia regardless of weather, wind or blog noise. It also preceded Ian’s predictable Q re ACORN. Recall too my fairly recent statements about back yard instruments in Macgregor v Canberra Airport and Tuggeranong BoM temperatures. There is no UHI or built environment boost to discount these readings provided your boots are not stuck in tar. IMO 6 C recovery by better landscaping round our growing cities is just another walk along the garden path for hopefuls given the extent of my observations. UHI is so oversold in all media i.e. no peg leg to stand on unless you are trying to be funny. I have no idea what you are talking about. I have given all the nearby stations for Bourke as requested but if you want to dispute previous extreme weather, that’s for others to judge. Obviously they are not using ACORN exclusively when they refer to 1958. (As an aside, the mean temp for Sydney Obs for May was higher in 1958 than 2014. No mention of that in the summary). Your UHI comment springs from left field. I haven’t mentioned it. However, if you ever want to check the influence of UHI, check Casino AWS and Casino manual station in the overlapping years from 1994-2012. Same elevation, 300m apart. Manual was near a tarred road with buildings nearby, AWS in an area with nothing nearby. A mean difference of 0.36C higher for the manual w/s. A don’t mind debating points but I don’t know what you really want and you keep changing the points i.e. Macgregor and Tuggeranong. Your last link was merely a chat about the weather dressed up with some rhetoric and statistics. You can walk into any gathering of people during a heatwave and hear a similar conversation. You seem to be deliberately missing the point of this post. If you torture figures for long enough, they will admit to anything. Heat waves in Australia are not unprecedented and of course they’re usually uncomfortable and of course they can cause some havoc. This post is about the torturing of figures, especially historical figures. Ian, your work here on the topic of adjusted Australian temperatures is appreciated but I maintain this approach, 1; it had to be done, 2; it can be done with hindsight based on clusters of old weather station records being compared modern real time temperature data. Also one weather station’s records do not give you a basis for a climate change discussion. UHI is not left field on this blog and since it’s more difficult for me to write about it now than talk about it I give you this chance to be wised up home style ACT 6254 4408 before I loose the plot again today. The stupidity of numbers is not, of course, due to the numbers but to those who can’t use their loaf to interpret numbers. Know why that official Southern H daily record max at Oodnadatta 1960 indicates something very serious? Because of the searing temp the day before and a temp of 50.3C the day after. This means it was very likely unrelieved heat with an average max of around 50C for three days. Most unlikely that the temp dropped enough for human comfort in between those max readings. There was also a day one over 47, making for the mother of all four day heatwaves. (I’d love to know what the wind was doing. Imagine if it was strong and from the north west!) Remember: 1960 was part of our longest, though not our worst, drought. You have use numbers to make yourself ready for reality not for more numbers. Are we preparing for another 1960 or another 2009 or 1896 or 1939 or 1967? Or are we squandering resources on mad dogma? No matter what you are discussing, numbers are just numbers, record highs and lows only tell a very thin story. Nothing exempts you from having to use your loaf. BEFORE you lose the plot? Sorry Gavin, I have no wish to be rude, but you have already demonstrated you have missed the plot. You are apparently in the process of rewriting the plot. ‘Recall too my fairly recent statements about back yard instruments in Macgregor v Canberra Airport and Tuggeranong BoM temperatures.’ but I am sure you can enlighten mean. You claim that one station, plus half a dozen comparable stations, does not give me the right to engage in a climate discussion. But your comment to justify your point appears based on only three comparative stations around ACT. The point is that there were extremely hot periods in the past. Trying to wipe them from history by adjusting, homogenising and truncating the record doesn’t make them any less an extreme event. Guys and Gals: Please have the guts to take me on in a direct conversation after I deal with my daily ordeal at rad outpatient’s clinic about lunch time today. I must be fully primed again with in the hour. I thought that was what we doing right here. Just state your case as to why we are wrong in a succinct way. I use the data that is available and I know it is fraught with problems due from different thermometers to resiting issues. The only monitoring of temperature which might be relied upon is the electronic AWS system which has only been around most sites since the early 1990s. As this system can pick up even the slightest hint of a rise and fall in temp in seconds (unlike older thermometers), it can’t be matched fairly with past monitoring systems when we are dealing with just tenths of a degree. ACORN was supposed to deal with the problems of past temperatures so they could be used for comparative purposes but it presents as many inconsistencies as the ‘raw’ data. So are you arguing that all these past extreme events never happened, were exaggerated or weather is worse now because we can only trust the most recent developments in monitoring? Or can’t trust the data because we do not know the prevailing conditions at the time of recording? RLP… sea level rise in Virginia. Here’s a plot of the trend at Sewell’s Point which I have read is a long lived gauge for that region. I also read that a big part of the problem for Norfolk is land subsidence – flooding and subsidence have long been issues for the region. Satellite altimetry seems to suggest very little actual absolute SLR which might confirm that much of the relative rise at the location is more related to subsidence. Bottom line though, not all sea level rise is necessarily due to warming. Ian; I gave you in particular an opportunity to delve deeper, use it or loose it cause I’m loosing patience. It’s worse than we thought! The beat-up, I mean. Surely you can share it on the blog. I have conceded that I find the temp record unreliable. Point me in the right direction. Visitor just arrived and accidentally hit submit. Thanks for the invitation re calling. However, I research my information re data very thoroughly (don’t always get it right but there you go). On the phone it would be impossible to check information quickly so I would rather ‘blog it out’. I would like you to spell out exactly what you are trying to get at. I’m just guessing at the moment so I really don’t know how to reply. Gavin is annoyed, but he is too exhausted and sore from treatment to continue debating online. What’s he annoyed about? I just deal with data – i don’t really speculate unless it’s obvious. I tried to address what he wanted – trouble is, I’m not sure what he wants. I’m sorry Gavin is in poor health. I’m just out of hospital myself after angioplasty. Give him my best wishes. I return momentarily still carrying the banner but with vitals increasingly on fire, just tilting at the hermit crabs scurrying under the wash.
Annoyed? Sure by my situation, unlikely to complete another sentence before loosing focus on any Q and forgetting my first response. What do I want? Simple chats, exchange on experience, differences etc to build a mutual position and another cuppa to finish my pills. Sounds good. Simple chats, etc. Could handle that. Sharing cuppas with BP pills. Thursday ok.
Off to the beach to test out my ‘new leg’. Re. a lengthy chat with Ian; agreements and differences all respected, some points laboured such as Australia’s historic N.A.T.A. system for across boundary trusted measurements and historic BoM independence in their data gathering, testing methods. Was it worthwhile? Sure and it was a great distraction from a personal pain time. Likewise and thanks for the technical info. Thanks for the link to bom-wow. Added it to my collection. as my thumb groups (although I am sure you are fully aware of them). Ian; from your latest link, I automaticly go to these other readings, this is the richness of modern weather recording and I suggest it is at the core of advanced climate study. Thanks for that. My friend that I mentioned told me much about the system when she showed me around the w/s she monitored (forgotten a bit over the years, of course).